Timberlake is not expected to press charges. A man was arrested after being "overzealous" and slapping Justin Timberlake in the face at a celebrity golf tournament over the weekend. TMZ reports that the man was escorted from the premises at the American Century Celebrity Pro-Am in Lake Tahoe. He was reportedly arrested after he refused to leave. 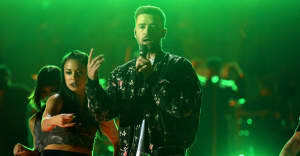 Timberlake was competing in the tournament and was slapped as he walked through a crowd of people. Footage captured on camera shows him confront the man as ask, “Bro, why would you do that?" after he was hit. Reports suggest that Timberlake, who finished 21st in the tournament, will not press charges.